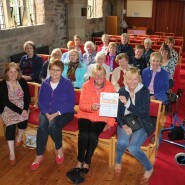 Cantata’s newest choir, Peak Harmony, was established in September 2015. Meetings take place at the Holy Trinity Church, Buxton Road, Whaley Bridge. As with all our choirs we sing a wide variety of music and have great fun at our rehearsals. New members are always welcome – we meet at 2pm every Tuesday in term time for 90 minutes of fun singing followed by a cup of tea and a biscuit.